Our second biggest natural attraction besides the waterfall are birds. 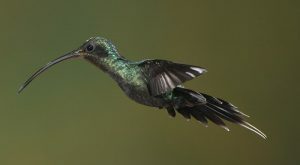 And we are proud to be home for a big variety of hummingbirds under which a few very rare species. When clients enter the restaurant normally the first words they speak are: ‘Look at all those hummers, amazing!‘ And some clients we really have to persuade to start the waterfall tour, else they would take only pictures. 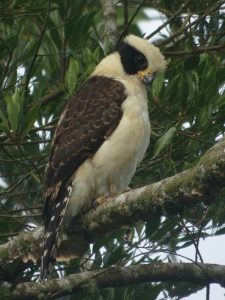 Many other birds visit our place too, think about the Oropendola Montezuma, toucan, black turkey, hawks, vultures and the trogon. Our bird list is here. The garden, which is so to speak ever-under-construction, is designed just to attract birds. So far, it took us already a few years and probably it will take another few years to mature. But little by little something beautiful is coming up. Our philosophy in this is that if we attract birds then the rest of the Eco-system will follow. Our ultimate goal is to attract the Quetzal on a permanent base. The Quetzal is native to the area but just needs a better habitat. And till now, we never met a person who did not like birds. So, if you want to just make a walk and enjoy the views and peace of the garden or you want to spot as many birds as you can…. it is all here. Some inside information: at our Blue Falls section (51 hectares) we are planning to plant soon hundreds and hundreds of native fruit trees. Especially at the slopes of the creeks and combined with the garden our area will become a bird paradise! As said before: birds are important to us and many birders have found our place, many more will follow. No reservations needed unless you are planning to come with a group and want to have lunch. Good to know that we do allow multi-flash setups but only with reservations and you have to bring all the equipment and know-how. Prices for birders are the same as for everybody else even if you stay the whole day, except for the multi-flashers. Please see our prices.